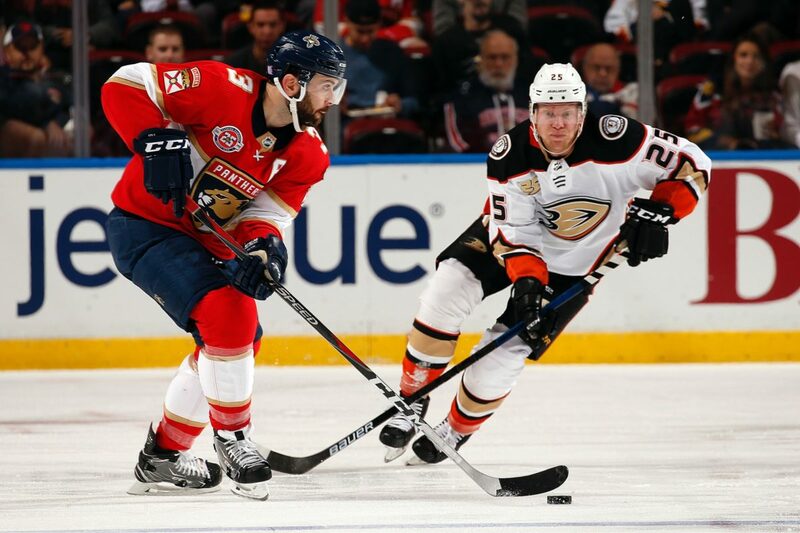 Sunrise, FL – The Panthers faced off against the Anaheim Ducks in game three of an eight-game homestand. The Panthers snapped a three-game losing streak on Monday night by beating the Devils 4-3 in overtime. Johnathan Huberdeau tied the game with 1:31 left in regulation and Mike Hoffman scored his second OT game-winning goal of the season. Heading into tonight’s game, Hoffman was the team leader with 23 points (12 goals, 11 assists). Huberdeau and Evgenii Dadonov are sitting close behind with 22 points each. Unfortunately for the Cats, the win streak snapped at one after losing to the Ducks tonight 3-2. The Panthers once again let crucial points slip out of their grasp. With less than two minutes left in the game, James Reimer was unable to come up with the defensive stop, leading to an untimely goal by Nick Ritchie. Despite controlling the second period and a fairly even third, Panther fans left with a disappointing outcome, continuing a frustrating theme that is becoming all too common so far in the season. Florida tied it in the 2nd period with Aaron Ekblad‘s fifth goal of the season. Cat Daddy Dadonov gave the Cats the lead after redirecting a Huberdeau shot for his 10th goal of the season. Anaheim returned the favor a few minutes later with Ritchie redirecting a Marcus Pettersson shot to square things up at two. The Panthers did have a season-high 44 shots on goal today but were only able to get two by [John] Gibson who was looking like vintage Greg Goldberg between the pipes tonight. Not the hot mess looking, arrested for public intoxication Goldberg. No one wants to be THAT guy. The third period was more contested for the Cats. Despite favoring quantity over quality when it came to shots on goal, they really didn’t create enough scoring opportunities. Which brings up a bitter question: What’s been more frustrating for us this season, not being able to put games away early or not being able to close out games late? The mood postgame was not very talkative as you could imagine. Coach Boughner continues to express his frustrations with his team’s execution. The Panthers now drop to 9-10-4 (22 points) on the season. I know it’s still only November but these are the games we’ll look back to later and wonder “if only”.